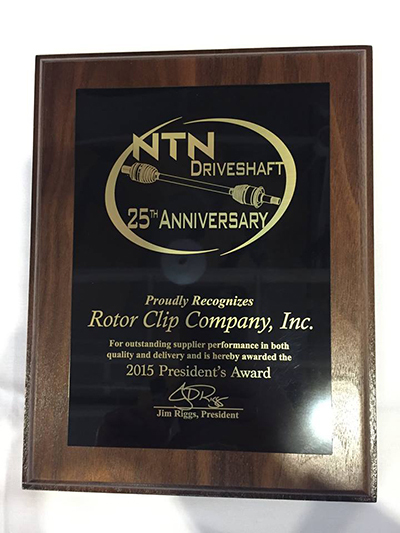 Rotor Clip was recently awarded the 2015 President's Award from NTN Driveshaft, Columbus, Indiana. The award recognizes suppliers who maintained 100% on time delivery and a perfect quality record for the 2015 calendar year. The award was presented to Rotor Clip at NTN’s annual Supplier Conference, held on 27 April 2016. Rotor Clip has been a supplier of retaining rings and related products to NTN for several years and holds numerous quality awards and certifications including ISO/TS 16949: 2009 automotive certification and ISO/AS9100C aerospace certification. The company is also certified to ISO14001:2004, the environmental standard.